When streaming live or VOD, any content provider needs some major metrics like views count, traffic, geography etc. One of the most anticipated stats is unique visitors count. As WMSPanel is a reporting panel for streamers, we also added this metric into our bundle. In WMSPanel, a "visitor" is considered unique for a pair of IP address and user agent utilized during 1 day. WMSPanel allows collecting stats from many servers' instances so if a viewer was watching videos from different servers, this viewer will be counted as one visitor. There are 2 levels of reporting for unique visitors. First one is a data slice which is a subset of statistics for a subset of servers, applications or streams including unique visitors stats. This allows sharing the stats with non-admins via white-label panel web UI. Any slice can be enabled with unique visitors count. Another level is per-streams and per-files unique visitors via Deep stats. 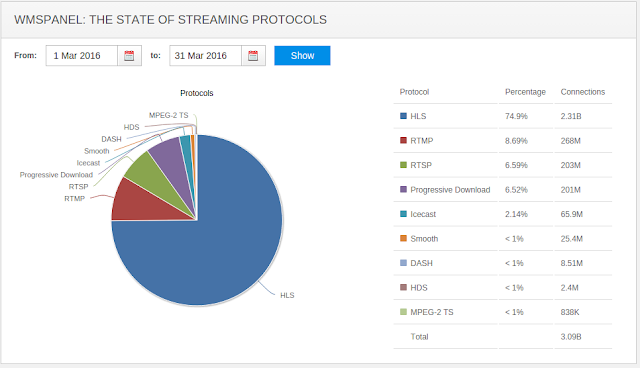 That feature set gives ability for per-stream and per-file statistics. Each stream or file may have its own set of daily stats including unique visitors. Visitors are unique within each stream or file. You have Full data slice with Deep stats enabled. Your slice peak visitors count is 100K, (i.e. S package) and Deep stats unique visitors are 150K (another S package). Your cost will be 5 USD for slice and5 USD for Deep, which is 10 USD per month total. You can find those details in our feature main page on our website. Let us know if you have any questions on this or other features.